The cmo/addatt command is used to add and initialize a new mesh object attribute. There are two variations on the command syntax, general and keyword. scalar: creates three attributes att_1snk, att_2snk, and att_3snk from an attribute att_v_src of rank vector. area_normal: creates vector attribute att_v_name and fills with the x,y,z components of area normals for each face. The new attribute is nelements in length, type is VDOUBLE, and rank is vector. normal_type choices include xyz, rtz, and rtp. The area normal is a vector perpendicular to the triangle face with length equal to the area of the triangle. Currently implemented for xyz on triangles only. unit_area_normal: is a vector perpendicular to the triangle face with length equal to one. This command has the same format as area_normal. median creates three element attributes (default names xmed, ymed, zmed) that are the coordinates of the median point (average value of the vertices) of each element. This is valid for all element types. voronoi creates three element attributes (default names xvor, yvor, zvor) that are the coordinates of the Voronoi point (center of circumscribed circle or sphere) of each element. This is only valid for elements of type tri and tet. This command does not check if a mesh is Delaunay, so a better syntax might be to call this circumscribed_center. hybrid_volume creates a node attribute nnodes in length and of type VDOUBLE which contains the volume of each hybrid median-Voronoi control volume. This is currently implemented for a tetrahedral mesh by calling the build stor function with the hybrid option. 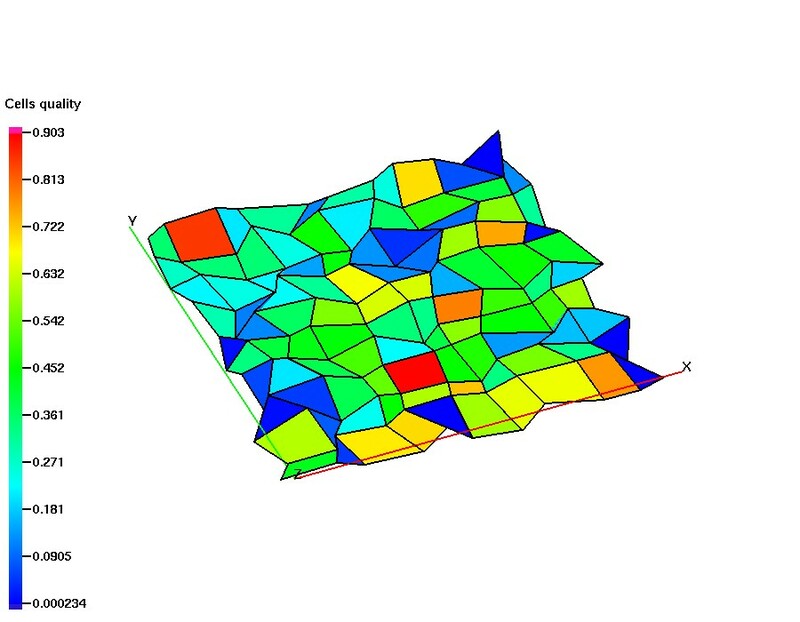 See dump/stor for details on what hybrid median-Voronoi volumes are. Currently this option is only available for 3D tetrahedral meshes. xyz_rtp creates three node attributes and fill them with the node coordinate, x,y,z in spherical coordinates, r,theta,phi. Default values for the attribute, if not specified are, c_r, c_theta, c_phi. xyz_rtz create three node attributes and fill them with the node coordinate, x,y,z in cylindrical coordinates, r,theta,z. Default values for the attribute, if not specified are, c_r, c_theta, c_z . synth_normal_area create node attributes, x_n_norm, y_n_norm, z_n_norm, and fill them with the area weighted normal of each node. synth_normal_angle create a node attributes, x_n_norm, y_n_norm, z_n_norm, and fill them with the angle weighted normal of each node. Note these synthetic node normal calculations are only supported for mesh objects of type line, tri and quad. If one wants to compute the normals to, for example, the outside nodes of a hex or tet mesh, one must first extract a surface mesh and then compute the normals to the surface mesh. The synthetic normal is computed by computing the normal to all elements incident upon a node and then taking the weighted average of all the normals. The weight factor is based on area or incident angle depending upon which option is selected. sumnode create an element attribute att_name_elem and fill it with the sum of the elements’ node attribute, att_name_node. avgnode create an element attribute att_name_elem and fill it with the average of the elements’ node attribute, att_name_node. minnode create an element attribute att_name_elem and fill it with the minimum value of the elements’ node attribute, att_name_node. maxnode create an element attribute att_name_elem and fill it with the maximum of the elements’ node attribute, att_name_node. quad_quality creates element attributes att_name_quality, att_name_regularity, and att_name_flag. These three attributes all describe the quality of each quadrilateral in a quad mesh. See example below. The following commands create element attributes related to element angle measurments. The Dihedral angle calculations are supported for tri, quad, tet, pyramid, prism, hex. The Solid angle calculation is only supported for tet elements. (quality/edge_ratio), minimum edge length (quality/ edge_min) and maximum edge length (quality/edge_max). Dihedral angle will be between 0 and 2π. Solid angle will be between 0 and 4π. Create node attribute named boron1 with interpolate method of asinh. Create node attribute named z_save then use copyatt to copy values from zic to z_save. Create attribute named boron3 with default mesh object settings. Create and fill element vector named anorm with the x,y,z components for area normals of each triangle. Create and fill element vector named n_face with the x,y,z components for unit area normals of each triangle. Create attributes xnorm, ynorm, znorm from the three components of the vector attribute anorm. Create vector attribute vnorm from the three attributes xnorm, ynorm, znorm. Create and fill attribute named darea with area of each triangle. Create and fill attribute named vor_vol with Voronoi volume of each node in tetrahedral mesh. Create and fill an attribute named hybrid_vol with the hybrid median-Voronoi volume of each node in a tetrahedral mesh. Create and fill attributes xvarea, yvarea, and zvarea with xyz components of the Voronoi areas for each node in triangle mesh. Create attributes named quality, regularity, and flag with several quad quality measures. is the longest length among the fouredges and the diagonals. is the mininum area of the four triangles constructed by adding a diagonal to the quad. This metric ranges from zero (poor) to one (good). This is a measure of the extent to which the quad is planar. The values range from zero (non-planar) to one (planar). 0 (good) = the quad is non-degenerate. For drawing a diagonal across it, the area vectors of the triangles have a positive dot product. 1 (degenerate) = at least one of the triangles detirmined by three of the vertices of the quad has zero area. That is the quad has degenerated into a triangle or worse. 2 (warped) = one of the quad's diagonals divides it into two triangles whose area vectors have a negative dot product. If the quad is planar, then this is self-intersecting or vertices are in wrong order by mistake.